On 21 November 2012, Rory Medcalf gave a major public lecture to launch the new Centre of Gravity Series, the flagship policy papers of the Strategic and Defence Studies Centre of the Australian National University, Canberra. 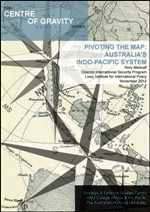 In recent years, the Asia-Pacific definition of Australia’s wider region has begun giving ground to an Indo-Pacific concept, which spans the Indian and Pacific oceans in a single maritime strategic system. But the Indo-Pacific idea remains controversial, with some observers equating it with a strategy to curb China’s role and status. This paper examines the debate about the Indo-Pacific, outlining why the concept properly defines Australia’s strategic and economic environment, why it can be inclusive towards China, and what it means for the strategic policy choices of Australia and other powers. The full text of the paper is available from the the Strategic and Defence Studies Centre at ANU, or can be downloaded using the 'Download PDF' button above.